You don't need to spend a lot of time or money on hat crafts for kids to make. 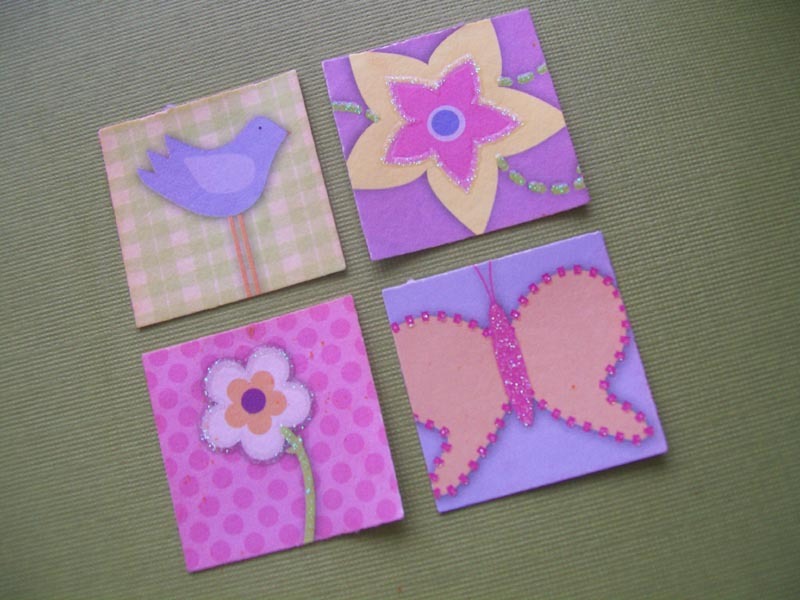 Many household materials or leftover items from craft projects work just as well as new supplies. What you make depends on the materials available and the age of the child for whom the hat is created. Young children, usually under the age of eight, love to make and decorate hats. They wear them during imaginative play as they pretend to be princesses, kings, pirates or even warriors. Most of these hats are easy to make and require few materials and little time. Fold two opposing corners toward the center, leaving about an inch or two open across the bottom. Fold this open flap up, as well as the corresponding flap on the back of the hat. Tuck in any corners and seal with tape or glue if necessary. For older children or adults, you can use larger pieces of paper. Newspaper works well too. Fold a square sheet of paper in half to form a triangle. Make sure it points down. Fold the two upper corners down toward the bottom point. This will form a diamond. Fold the bottom flaps up to touch the top of the diamond. Fold the tops of those flaps outward. Fold the bottom flap of the hat up, leaving about an inch unfolded. Do the same to the back. Take that edge and fold it up slightly. Do the same to the back side. Squeeze or tape the side edges together. Purchase a straw hat, some ribbon and silk or plastic flowers from a local discount or craft store if you don't have these items at home. Cut the stems off the flowers. Make a bow from the ribbon. Hot glue the flowers around the hat and then the ribbon in back. Use as many or as few flowers as you want! Measure the circumference of your child's head. Draw a crown on a sheet of paper about one inch bigger than this measurement. Decorate with paints, crayons or just about anything! Cut out the crown, and tape or glue the edges together. Measure the circumference of your child's head and divide by two. Cut two long triangles from fabric or felt. They should be about two inches wider than your measurement in step one. Turn up the long edge of each hat. Glue or baste the two triangles together. Have your child decorate with markers or paints. A prepackaged craft project such as this Thanksgiving turkey hat is easy and fun for kids to create. Most of these types of crafts come with everything already cut out and ready to assemble. You could also follow this pattern to create your own turkey hat with your own materials. Embellishments such as beads, buttons and gems make wonderful additions to any homemade hat. Other items you can use as part of your hat crafts for kids to make include dried pasta, googly eyes, pipe cleaners, stickers and glitter. Once your children are done making hats, let them try their hand at creating a few ladybugs.